Showcase - Dankelman pakt an! I remember when I bought this flexi record, in Rotterdam, twenty years ago. The thin piece of plastic didn’t have a sleeve, but many of these flexi records never had a sleeve in the first place, and I don’t really care about such details anyway. Dutch advertisement records and flexi’s are the only records that I really collect, but I never had heard of this record. When I played it later at home, I had 15 minutes of collectors heaven. 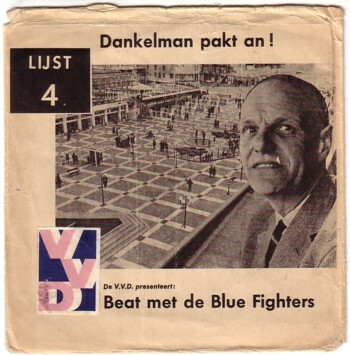 The record was made as a promotion for a local right wing politician ( Dankelman ), who hoped to win the elections of The Hague in 1966. To gain popularity among young voters he had a local beat band record four songs in a studio. This band, The Blue Fighters, never recorded any other record, so that makes this flexi a very nice find, even without a sleeve. But it is mr Dankelman himself who made my day. In between the songs he recorded fake interviews and he even tries to make the listeners believe that he danced to the music of The Blue Fighters. Believe me when i say that this man is beyond hilarious. An alien without any preparation could have done a better job. It is all in Dutch of course, but I share it with you anyway. Ten years later I found an empty sleeve of the flexi record. This phenomenon (finding the record and the sleeve of a rare record at different places and different times) is worth giving some extra attention, but not here and now. Here is a fragment of mr Dankelman and The Blue Fighters.